It's the weekend, the perfect time to indulge yourself in a little DIY home makeover. I was looking for a fun pop art inspired painting to fill some white space in my condo. Not wanting to spend hundreds of dollars on art I did some searching of "easy art" and stumbled upon the idea of word art. First step: hit the clearance racks! Go to TJ Maxx or another discounter and purchase the cheapest painting they have that fits the size you want. Doesn't matter what the painting is of because you're going to paint right over it. Next go home and tape around the edges of your purchased painting so you don't get paint on the frame. Now paint over the entire painting with a background color of your choice-- I decided to go white so all the bright colors I was using would pop. Then have at it! Pick a word you won't get sick of looking at and start there. I'm not much of an artist but I knew I could write the word "love" about 200 times. So that's just what I did...in about 20 different colors. 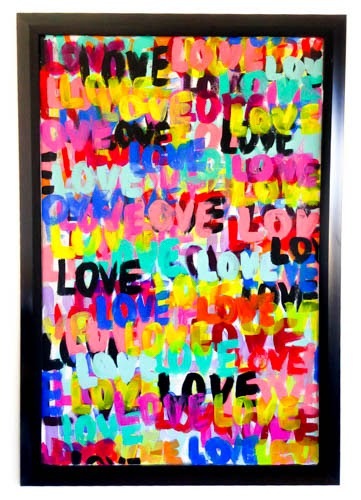 The impact of this art is all about the color choice so as long as you have that down you're bound to love the results. Have fun!